It is tempting to describe Stranger Things as a love letter to ‘80s sci-fi and horror or an homage to the early work of Steven Spielberg. But this new Netflix series extends beyond the bounds of mere tribute. It’s more like a portal into the kid-focused, fantasy-fueled, occasionally frightening films of that decade — pictures like E.T., Poltergeist, The Goonies, and Gremlins. Anyone who starts watching an episode of Stranger Things out of context could easily be convinced they’ve stumbled upon a movie made in 1983 instead of a 2016 TV period piece that’s set in 1983. Even the opening titles, backed by a sinister, synthesizer-heavy theme song and dotted with deliberate visual glitches, suggest this whole series was transferred directly to Netflix from an old VHS tape. Matt and Ross Duffer, the twin siblings known as the Duffer brothers who created Stranger Things and co-directed six of its eight episodes (Shawn Levy of Night at the Museum fame directed the other two), have effectively crafted a world that’s reflective of America in the time of Reagan and the Rubik’s Cube. All the wood-paneled rec rooms, rotary phones, and microfiche scanners accurately capture the way it looked back then, while the story taps into the possibility that the era’s pop culture promised: that odd, otherworldly adventure and/or terror could be found in everyday, analog suburbia. You don’t necessarily have to be a child of the ‘80s or a connoisseur of its films to enjoy this series. But it definitely helps. The aforementioned terror arrives immediately in Stranger Things, courtesy of what appears to be a bloodthirsty creature let loose inside the Hawkins National Laboratory, a suspicious Department of Energy facility located in the small town of Hawkins, Indiana. An attack on a panicky, lab-coated staffer cuts to a scene ripped straight from the early moments in E.T. : a group of semi-nerdy boys gathered around a table, engaged in an intense game of Dungeons & Dragons. Shortly after that D&D session breaks up, one of the four preteen friends, a gentle, slightly outcast soul named Will (Noah Schnapp), heads home and quickly finds himself terrorized by the same beast; in another moment that’s inspired by E.T. and also subverts it, Will attempts to flee from the creature by running out of his house and into a shed. But instead of encountering a new alien friend and feeding him some Reese’s Pieces, the shaken boy suddenly disappears, with no clear explanation as to where he’s gone. The attempt to find Will and explain that vanishing act drives the narrative of Stranger Things, as an increasing number of characters become invested in identifying that freaky monster and figuring out exactly what’s going on at the Hawkins lab. Those characters include Will’s addled, grief-stricken mother Joyce (Winona Ryder); his brother Jonathan (Charlie Heaton); world-weary police chief Jim Hopper (David Harbour); Will’s three plucky D&D buddies, Dustin (Gaten Matarazzo), Lucas (Caleb McLaughlin), and Mike (Finn Wolfhard), who always sound like they’re one breath away from shouting “Goonies never say die!”; Mike’s studious sister Nancy (Natalia Dyer); and a mysterious, practically mute young girl who refers to herself only as Eleven (Millie Bobby Brown). Stranger Things tries to strike a tricky balance between going fully meta and creating a piece of paranoid, magical, terrifying realism that can stand shoulder to shoulder with the works of Spielberg, Stephen King, John Carpenter, and Wes Craven that it so overtly references. At times, it wobbles in that effort. But it manages to right itself pretty quickly by effectively hooking us into its central mystery and so evocatively conjuring up a not-so-long-ago yesteryear when walkie-talkie conversations were our Snapchat and what’s now considered free-range parenting was just called parenting. In another example of that meta-ness, two actors whose careers began in the ‘80s — Ryder and Matthew Modine, who co-stars as a high-placed doctor at the lab — assume key parental roles, overseers of the kids now pursuing their own “vision quests.” Of the two, Ryder has the much bigger, juicier part, one that suits her best when it gives her the opportunity to reveal the resilience beneath her character’s frailty. She’s grounded and convincing in Joyce’s moments of anger and quiet resolve, but in the scenes where Ryder has to take her character to the depths of despair, the gears of her acting sometimes grind a tiny bit too loudly. 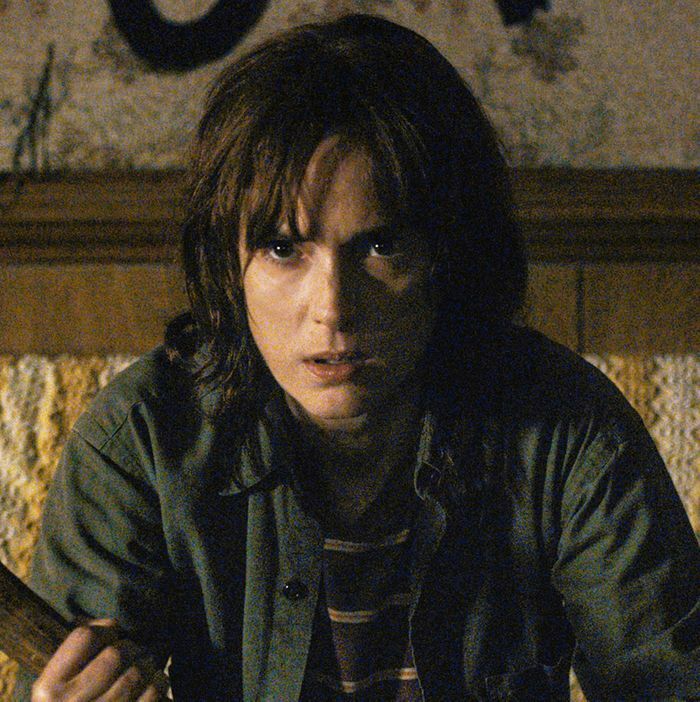 Still, like so much in Stranger Things, our preexisting relationship with her work informs our response; it feels appropriate, welcome, and almost comforting to see Ryder playing the lead in a series like this. As key as Ryder is, a lot of the heavy lifting performance-wise falls on the kids. Thankfully, they are up to the task. The boys — McLaughlin, Matarazzo, Wolfhard and, to a lesser extent simply because he has less screen time, Schnapp — achieve a believable A.V. clubbers’ chemistry with each other and manage to explain much of the show’s pseudoscience like pros. But the real revelation is Millie Bobby Brown. As the enigmatic, often silent Eleven, a girl with telekinetic powers and the closely shaven haircut of a cancer patient undergoing chemo, Brown conveys a range of emotions — fear, confusion, raw fury — using only her eyes and a face that itself seems like a portal into some parallel universe. In such a Spielbergian project, the Duffer brothers undoubtedly wanted their Eleven to have a genuine Spielberg face. Brown’s definitely got one; you watch her and you’re reminded of Henry Thomas in E.T. and Samantha Morton in Minority Report all at once. When she gets to share the screen with Ryder, who was roughly the same age as Brown when she landed her first role in the movie Lucas, it’s a lovely, circle-of-life moment. Admittedly, the world-building in Stranger Things isn’t always as airtight as it could be. The attempt to describe and depict a netherworld of sorts feels consistently murky, and not just because there’s a lot of gross gook in that parallel dimension. At one point, a death is faked in a way that’s never adequately explained. When Ryder’s Joyce starts to believe her missing son is communicating with her through the flashing lamps and Christmas lights in her house, it’s an obvious riff on Carol Anne’s ability to speak through the TV static in the movie Poltergeist. Yet, despite the fact that we see Joyce holding tickets for Poltergeist in a flashback, neither she nor anyone else ever says anything as overt as, “You know, this whole kid talking through the lights thing is an awful lot like Poltergeist.” And visually, the twinkling of all those bulbs is both pretty and eerie; the execution works, so you forgive any gaps in logic behind it. In a way, that moment captures exactly what makes Stranger Things such a binge-watchable mix of nostalgia and dark mystery. It’s a show about how childhood can easily end in an instant and about how our pop-culture touchstones enable us, years later, to find them again.